Journal of the House of Lords: Volume 64, 1831-1832. Originally published by His Majesty's Stationery Office, London, [n.d.]. Die Jovis, 21° Junii 1832. Sir C. Cockerell et al. v. Cholmeley. Flowerdew v. The Dundee, &c. Shipping Co.
His Majesty to be attended with Address of both Houses. Tithes & Vestry Laws, (Ireland,) Petitions from Fiddown & Donaghcavey for Abolition of. Message to H.C. with it. Beer Act, Petition from Burslem for Repeal of. Education, (Ireland,) Petitions from Mayo & Tuam in favor of proposed Plan. Message to H.C. to acquaint them of the Time appointed to attend His Majesty with Address of both Houses. Lewis v. Colmer et al. Petition of Respondent Sampson for Time for his Case, referred to Appeal Com ee. Weir v. Glenny et al. Education, (Ireland,) Papers respecting, Ordered. Emigration, Petition from Longford to facilitate, in case of passing the Reform (Ireland) Bill. Summons of the Lords, Order for, discharged. Ds. Templemore. March. Lansdowne, Præses. Ds. Melbourne, Unus Primariorum Secretariorum. It is Ordered, That the further Consideration of the said Cause be put off sine Die. And Counsel appearing for the Respondent, and no Counsel appearing for the Appellant, and the Agent for the Appellant praying that the Appeal might stand over, but declining to pay the Costs of the Day of the Respondent, the House Resolved, That the Appeal should be dismissed, with Costs; and gave Leave to the Appellant to petition the House upon the whole Matter, as he might be advised; and the Respondent was ordered to deliver in his Bill of Costs, and the Cause to stand over in the mean time. Ordered, That the Cause wherein William Allen Flowerdew is Appellant, and The Dundee, Perth and London Shipping Company are Respondents, be heard by Counsel at the Bar To-morrow. The House was resumed by The Earl of Shaftesbury, who sat Speaker by virtue of a former Commission. The Lord Steward reported, "That the Lords with White Staves had (according to Order) waited on His Majesty, humbly to know what Time His Majesty would please to appoint to be attended with the Address of both Houses of Parliament; and that His Majesty had appointed Wednesday next, at Two o'Clock, at His Palace of Saint James." 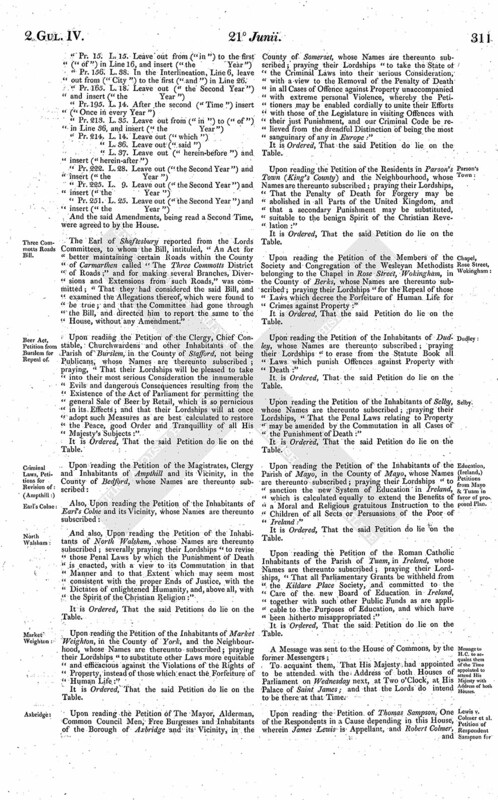 Upon reading the Petition of the Parishioners of the Union of Fiddown, in the County of Kilkenny, whose Names are thereunto subscribed; praying their Lordships "for the more equitable Appropriation of Church Property in future, and the total and unqualified Abolition of Tithes, the injurious Effects of which are so manifest throughout the whole of Ireland, and so relieve the distressed Occupier of its Soil from a Burthen which he is both unable and unwilling to bear:"
Upon reading the Petition of the Inhabitants of the Parish of Donaghcavey, in the County of Tyrone, Ireland, whose Names are thereunto subscribed; praying their Lordships "to apply an effectual Remedy to the dreadful Evils which afflict Ireland, by repealing the unjust and insulting Vestry Laws, and by a total and unequivocal Abolition of the oppressive Tithe System, providing at the same Time a Support for the entire Body of the Protestant Clergy out of the immensely valuable Church Lands of Ireland; and by those Means to promote on the one Hand the Peace, Prosperity and Happiness of the People, and on the other the Strength, Stability and Security of the Empire:"
Ordered, That the House be put into a Committee upon the said Bill on Monday next; and that the Lords be summoned. Hodie 3a vice lecta est Billa, intituled, "An Act to confirm certain Leases granted by James Weller Ladbroke Esquire of Land and Premises at Nottinghill, in the County of Middlesex; and for other Purposes." To carry down the said Bill, and desire their Concurrence thereto. Hodie 3a vice lecta est Billa, intituled, "An Act for repealing Parts of, and amending and enlarging the Powers of other Parts of an Act for embanking and draining certain Fens and Low Lands in the Parishes of Nocton and Potterhanworth, in the County of Lincoln, and in the Parish of Branston, in the County of the City of Lincoln." The Earl of Shaftesbury reported from the Lords Committees, to whom the Bill, intituled, "An Act for better paving, lighting, watching, cleansing and otherwise improving the City of Exeter and County of the same City," was committed; "That they had considered the said Bill, and examined the Allegations thereof, which were found to be true; and that the Committee had gone through the Bill, and made several Amendments thereto." "L. 34. Leave out from ("Commissioners") to ("exclusive") in Line 35. "L. 23. Leave out from ("Office") to ("after") in Line 25. "Pr. 12. L. 15. After ("re-appointed") insert Clause A. "Clause A. 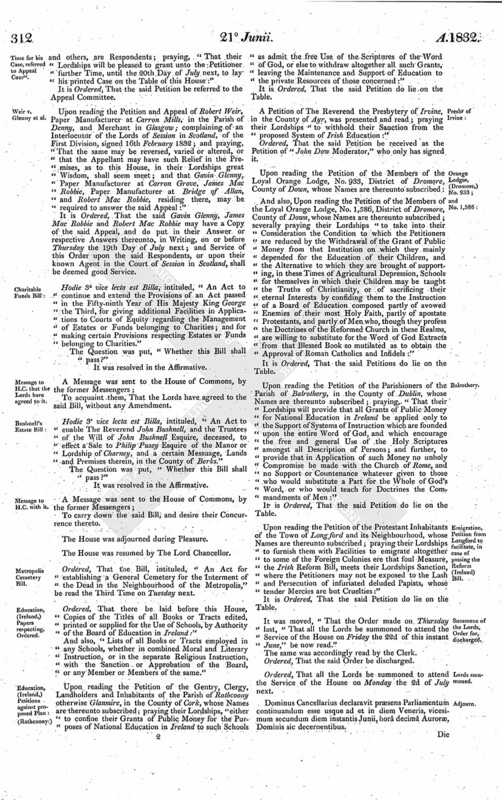 And whereas several of the said Parishes and Precincts will, immediately on the Commencement of this Act, be entitled to elect, by virtue of the Provisions herein-before contained, an additional Number of Commissioners; and it is necessary to provide for the going out of Office of such Commissioners; be it therefore enacted, That on the Second Monday in January One thousand eight hundred and thirty-five One Third (or as near that Proportion as the Number will admit of such Division) of such additional Commissioners so to be elected on the Commencement of this Act shall go out of Office and cease to be Commissioners; and on the Second Monday in January One thousand eight hundred and thirty-seven One Half of the remaining Two Thirds of the said additional Commissioners shall go out of Office and cease to be Commissioners; and on the Second Monday in January One thousand eight hundred and thirty-nine the Remainder of the said additional Commissioners shall go out of Office and cease to be Commissioners; and on the Second Monday in January in every subsequent Second Year the One Third who have been longest in Office of the said additional Commissioners shall go out of Office and cease to be Commissioners; and the Election, Appointment and going out of Office of the said additional Commissioners and their Successors shall in all other respects be proceeded upon in like Manner, and be subject to the same Rules, Regulations, Provisions and Restrictions, as are next herein-before contained touching and concerning the Election and Appointment of Commissioners and their Successors." "Pr. 156. L. 38. In the Interlineation, Line 6, leave out from ("City") to the first ("and") in Line 26. And the said Amendments, being read a Second Time, were agreed to by the House. The Earl of Shaftesbury reported from the Lords Committees, to whom the Bill, intituled, "An Act for better maintaining certain Roads within the County of Carmarthen called "The Three Commotts District of Roads;" and for making several Branches, Diversions and Extensions from such Roads," was committed; "That they had considered the said Bill, and examined the Allegations thereof, which were found to be true; and that the Committee had gone through the Bill, and directed him to report the same to the House, without any Amendment." 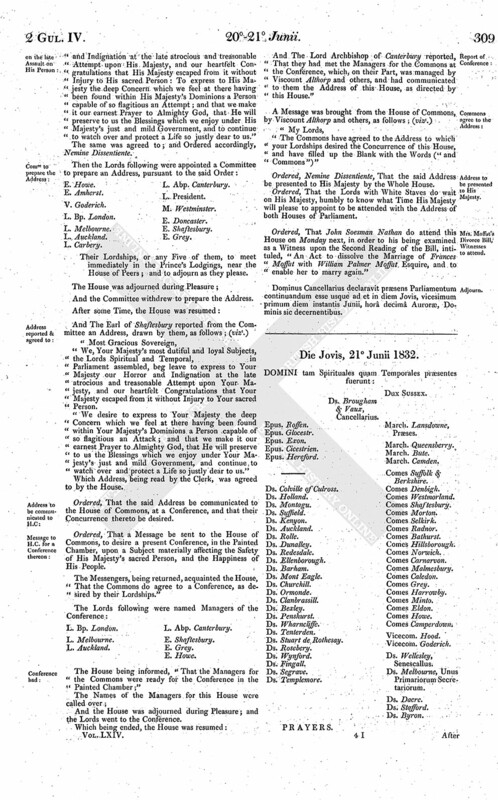 Upon reading the Petition of the Clergy, Chief Constable, Churchwardens and other Inhabitants of the Parish of Burslem, in the County of Stafford, not being Publicans, whose Names are thereunto subscribed; praying, "That their Lordships will be pleased to take into their most serious Consideration the innumerable Evils and dangerous Consequences resulting from the Existence of the Act of Parliament for permitting the general Sale of Beer by Retail, which is so pernicious in its Effects; and that their Lordships will at once adopt such Measures as are best calculated to restore the Peace, good Order and Tranquillity of all His Majesty's Subjects:"
And also, Upon reading the Petition of the Inhabitants of North Walsham, whose Names are thereunto subscribed; severally praying their Lordships "to revise those Penal Laws by which the Punishment of Death is enacted, with a view to its Commutation in that Manner and to that Extent which may seem most consistent with the proper Ends of Justice, with the Dictates of enlightened Humanity, and, above all, with the Spirit of the Christian Religion:"
Upon reading the Petition of the Inhabitants of Market Weighton, in the County of York, and the Neighbourhood, whose Names are thereunto subscribed; praying their Lordships "to substitute other Laws more equitable and efficacious against the Violations of the Rights of Property, instead of those which enact the Forfeiture of Human Life:"
Upon reading the Petition of The Mayor, Alderman, Common Council Men, Free Burgesses and Inhabitants of the Borough of Axbridge and its Vicinity, in the County of Somerset, whose Names are thereunto subscribed; praying their Lordships "to take the State of the Criminal Laws into their serious Consideration, with a view to the Removal of the Penalty of Death in all Cases of Offence against Property unaccompanied with extreme personal Violence, whereby the Petitioners may be enabled cordially to unite their Efforts with those of the Legislature in visiting Offences with their just Punishment, and our Criminal Code be relieved from the dreadful Distinction of being the most sanguinary of any in Europe:"
Upon reading the Petition of the Residents in Parson's Town (King's County) and the Neighbourhood, whose Names are thereunto subscribed; praying their Lordships, "That the Penalty of Death for Forgery may be abolished in all Parts of the United Kingdom, and that a secondary Punishment may be substituted, suitable to the benign Spirit of the Christian Revelation:"
Upon reading the Petition of the Members of the Society and Congregation of the Wesleyan Methodists belonging to the Chapel in Rose Street, Wokingham, in the County of Berks, whose Names are thereunto subscribed; praying their Lordships "for the Repeal of those Laws which decree the Forfeiture of Human Life for Crimes against Property:"
Upon reading the Petition of the Inhabitants of Dudley, whose Names are thereunto subscribed; praying their Lordships "to erase from the Statute Book all Laws which punish Offences against Property with Death:"
Upon reading the Petition of the Inhabitants of Selby, whose Names are thereunto subscribed; praying their Lordships, "That the Penal Laws relating to Property may be amended by the Commutation in all Cases of the Punishment of Death:"
Upon reading the Petition of the Inhabitants of the Parish of Mayo, in the County of Mayo, whose Names are thereunto subscribed; praying their Lordships "to sanction the new System of Education in Ireland, which is calculated equally to extend the Benefits of a Moral and Religious gratuitous Instruction to the Children of all Sects or Persuasions of the Poor of Ireland:"
Upon reading the Petition of the Roman Catholic Inhabitants of the Parish of Tuam, in Ireland, whose Names are thereunto subscribed; praying their Lordships, "That all Parliamentary Grants be withheld from the Kildare Place Society, and committed to the Care of the new Board of Education in Ireland, together with such other Public Funds as are applicable to the Purposes of Education, and which have been hitherto misappropriated:"
To acquaint them, That His Majesty had appointed to be attended with the Address of both Houses of Parliament on Wednesday next, at Two o'Clock, at His Palace of Saint James; and that the Lords do intend to be there at that Time. Upon reading the Petition of Thomas Sampson, One of the Respondents in a Cause depending in this House, wherein James Lewis is Appellant, and Robert Colmer, and others, are Respondents; praying, "That their Lordships will be pleased to grant unto the Petitioner further Time, until the 20th Day of July next, to lay his printed Case on the Table of this House:"
It is Ordered, That the said Petition be referred to the Appeal Committee. Upon reading the Petition and Appeal of Robert Weir, Paper Manufacturer at Carron Mills, in the Parish of Denny, and Merchant in Glasgow; complaining of an Interlocutor of the Lords of Session in Scotland, of the First Division, signed 16th February 1832; and praying, "That the same may be reversed, varied or altered, or that the Appellant may have such Relief in the Premises, as to this House, in their Lordships great Wisdom, shall seem meet; and that Gavin Glenny, Paper Manufacturer at Carron Grove, James Mac Robbie, Paper Manufacturer at Bridge of Allan, and Robert Mac Robbie, residing there, may be required to answer the said Appeal:"
It is Ordered, That the said Gavin Glenny, James Mac Robbie and Robert Mac Robbie may have a Copy of the said Appeal, and do put in their Answer or respective Answers thereunto, in Writing, on or before Thursday the 19th Day of July next; and Service of this Order upon the said Respondents, or upon their known Agent in the Court of Session in Scotland, shall be deemed good Service. Hodie 3a vice lecta est Billa, intituled, "An Act to continue and extend the Provisions of an Act passed in the Fifty-ninth Year of His Majesty King George the Third, for giving additional Facilities in Applications to Courts of Equity regarding the Management of Estates or Funds belonging to Charities; and for making certain Provisions respecting Estates or Funds belonging to Charities." Hodie 3a vice lecta est Billa, intituled, "An Act to enable The Reverend John Bushnell, and the Trustees of the Will of John Bushnell Esquire, deceased, to effect a Sale to Philip Pusey Esquire of the Manor or Lordship of Charney, and a certain Messuage, Lands and Premises therein, in the County of Berks." The House was resumed by The Lord Chancellor. Ordered, That the Bill, intituled, "An Act for establishing a General Cemetery for the Interment of the Dead in the Neighbourhood of the Metropolis," be read the Third Time on Tuesday next. Ordered, That there be laid before this House, Copies of the Titles of all Books or Tracts edited, printed or supplied for the Use of Schools, by Authority of the Board of Education in Ireland:"
And also, "Lists of all Books or Tracts employed in any Schools, whether in combined Moral and Literary Instruction, or in the separate Religious Instruction, with the Sanction or Approbation of the Board, or any Member or Members of the same." 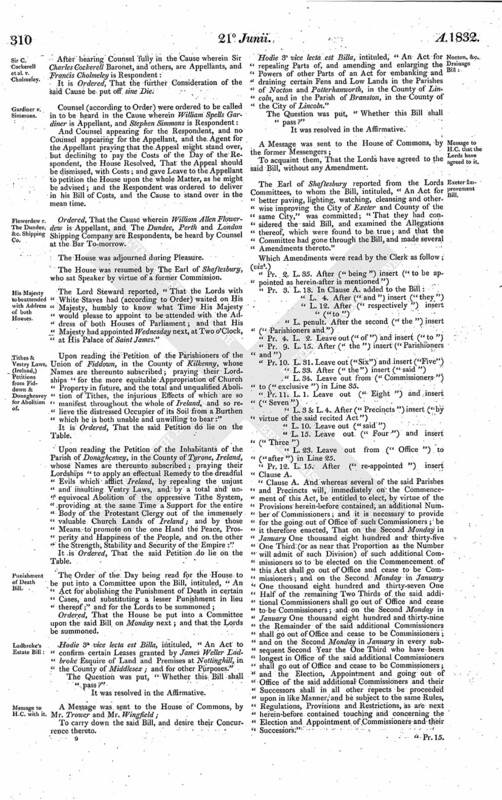 Upon reading the Petition of the Gentry, Clergy, Landholders and Inhabitants of the Parish of Rathcoony otherwise Glanmire, in the County of Cork, whose Names are thereunto subscribed; praying their Lordships, "either to confine their Grants of Public Money for the Purposes of National Education in Ireland to such Schools as admit the free Use of the Scriptures of the Word of God, or else to withdraw altogether all such Grants, leaving the Maintenance and Support of Education to the private Resources of those concerned:"
A Petition of The Reverend the Presbytery of Irvine, in the County of Ayr, was presented and read; praying their Lordships "to withhold their Sanction from the proposed System of Irish Education:"
Ordered, That the said Petition be received as the Petition of "John Dow Moderator," who only has signed it. And also, Upon reading the Petition of the Members of the Loyal Orange Lodge, No. 1,586, District of Dromore, County of Down, whose Names are thereunto subscribed; severally praying their Lordships "to take into their Consideration the Condition to which the Petitioners are reduced by the Withdrawal of the Grant of Public Money from that Institution on which they mainly depended for the Education of their Children, and the Alternative to which they are brought of supporting, in these Times of Agricultural Depression, Schools for themselves in which their Children may be taught the Truths of Christianity, or of sacrificing their eternal Interests by confiding them to the Instruction of a Board of Education composed partly of avowed Enemies of their most Holy Faith, partly of apostate Protestants, and partly of Men who, though they profess the Doctrines of the Reformed Church in these Realms, are willing to substitute for the Word of God Extracts from that Blessed Book so mutilated as to obtain the Approval of Roman Catholics and Infidels:"
Upon reading the Petition of the Parishioners of the Parish of Balrothery, in the County of Dublin, whose Names are thereunto subscribed; praying, "That their Lordships will provide that all Grants of Public Money for National Education in Ireland be applied only to the Support of Systems of Instruction which are founded upon the entire Word of God, and which encourage the free and general Use of the Holy Scriptures amongst all Description of Persons; and further, to provide that in Application of such Money no unholy Compromise be made with the Church of Rome, and no Support or Countenance whatever given to those who would substitute a Part for the Whole of God's Word, or who would teach for Doctrines the Commandments of Men:"
Upon reading the Petition of the Protestant Inhabitants of the Town of Longford and its Neighbourhood, whose Names are thereunto subscribed; praying their Lordships to furnish them with Facilities to emigrate altogether to some of the Foreign Colonies ere that foul Measure, the Irish Reform Bill, meets their Lordships Sanction, where the Petitioners may not be exposed to the Lash and Persecution of infuriated deluded Papists, whose tender Mercies are but Cruelties:"
It was moved, "That the Order made on Thursday last, "That all the Lords be summoned to attend the Service of the House on Friday the 22d of this instant June," be now read." Ordered, That all the Lords be summoned to attend the Service of the House on Monday the 2d of July next. Dominus Cancellarius declaravit præsens Parliamentum continuandum esse usque ad et in diem Veneris, vicesimum secundum diem instantis Junii, horâ decimâ Auroræ, Dominis sic decernentibus.